Detailing the physical features, habits, territorial reach and other identifying qualities of the Thread-Waisted Wasp. 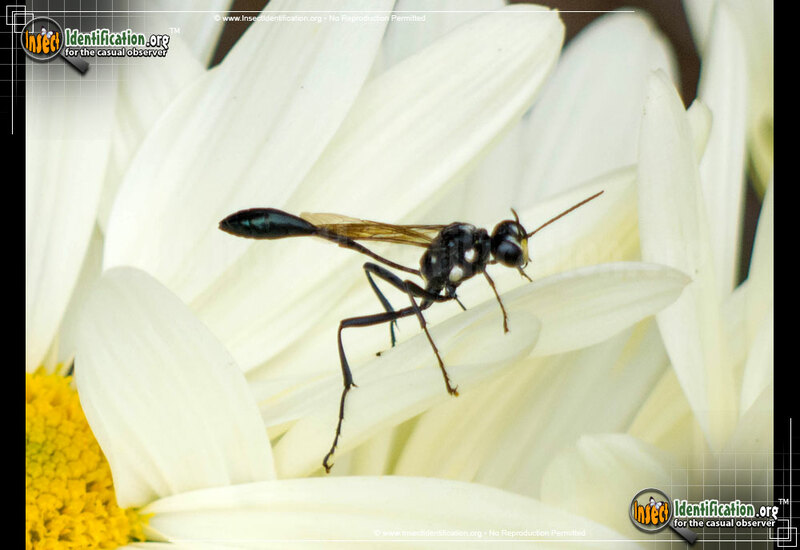 Thread-Waisted Wasps may look fragile, but they have tremendous strength in their small bodies, tackling hefty caterpillars on a daily basis. 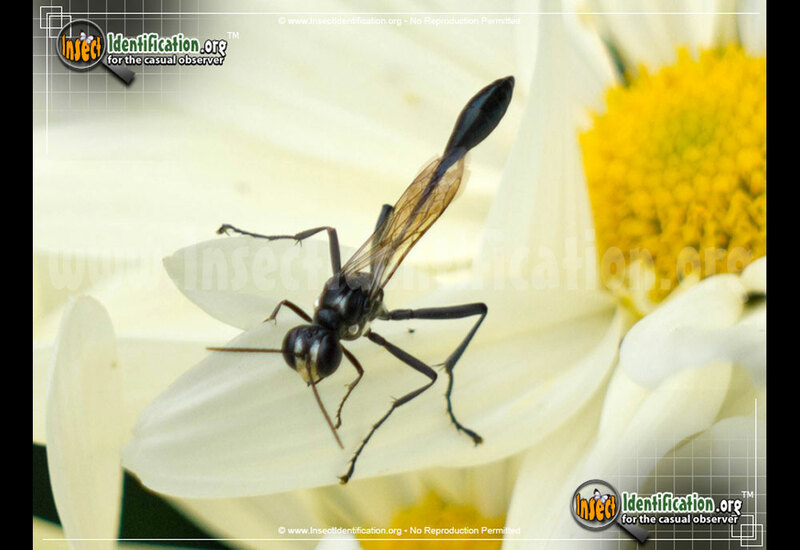 Thread-Waisted Wasps are also known as Needle-Waisted Wasps. It is hard to believe that fluids can pass through such a narrow center, but it works. They frequent blossoms to drink from and hunt on. Popular plant varieties to check are asters, Queen Anne's lace, horsemint, and goldenrod. 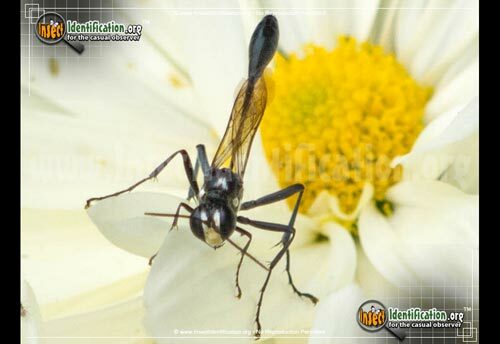 The black body can appear blue in some light and the thorax has white spots on near the joints where the legs connect. They have strong jaws and are nimble in flight. Found on flowers either mating, searching for caterpillars, or drinking nectar, female Thread-Waisted Wasps work hard to ensure the next generation gets a great start. She builds a burrow and fills it with fertilized eggs. She hunts and tackles a plump caterpillar and stings it, paralyzing, but not killing it. She then hauls the paralyzed caterpillar back to her burrow and places it next to her eggs. She carefully covers the entrance of her burrow with dirt, debris and rocks to hide it from things that would eat her eggs and rob her of all her hard work. Once hatched, the wasp larvae feed on the still living, but immobile caterpillar until they pupate. 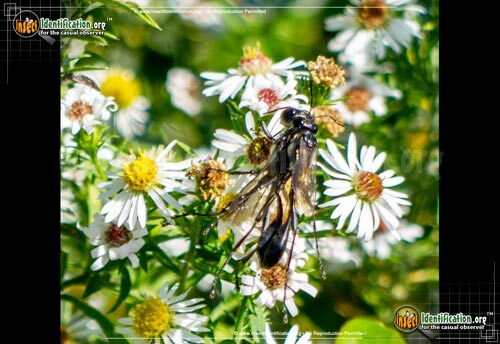 When they emerge as winged adults, the search for nectar to drink and a mate begins anew.